The ocean surface is in continual motion. Waves are the result of disturbance of the water surface; waves themselves represent a restoring force to calm the surface. The standard example is the rock-in-the-pond scenario. The rock provides the disturbing force, and generates waves that radiate outward, eventually losing their momentum and dissipating their energy so that the pond returns to calm. Wave characteristics include a crest at the top and a trough at the bottom. The difference in elevation between the crests and trough is the wave height. The distance between the crest or the troughs of waves is termed the wavelength. The ratio of wave height to wavelength is the wave's steepness. A cohesive force, termed capillarity, holds the water molecules of the ocean surface together, allowing insects and debris to be supported. Capillarity is the initial restoring force for any body of water. The major disturbing force in the open ocean is wind. As winds begin to blow across the surface, they create pressure and stress. Small, rounded waves, called capillary waves, begin to form. These "ripples" have very short wavelengths, less than 1.74 centimeters (0.7 inch). For these small waves, capillarity is the restoring force that smoothes the surface. As winds increase, capillary wave development increases and the sea surface becomes rough. This presents perfect conditions for the wind to catch more surface area of the wave, transferring increased energy to the water. As the young wave grows in height, gravity replaces capillarity as the restoring force, and the wave becomes a gravity wave with wavelengths exceeding 1.74 centimeters. These waves now exhibit the standard profile of a progressive wave. Waves at the surface of the ocean and lakes are orbital progressive waves. This type of wave forms at the boundary of two liquids of different density, in this case air and water. The wave form moves forward with a steady velocity, so it is called "progressive." The water itself moves very little: Like the crowd in a football stadium doing "the wave," individual particles of water move up and then down, but do not follow the moving wave form. The complete motion of the water particles is a circle, so that a small object floating on top of the wave actually describes a circle as the wave goes underneath it. height to the wave length. When the wave builds and reaches a steepness greater than a ratio of 1:7, the wave breaks and spills forward. The wave has actually become too steep to support itself and gravity takes over. Breakers are normally associated with shorelines, where they are known as surf, but can occur anywhere in the ocean. The passage of a wave only affects the water down to the wave base, which is half the wave length. Below that depth there is negligible water movement. This is the part of the water column that submarines use for "clear sailing." Waves in water deeper than half their wavelengths are known as deep water waves. Their speed in meters per second can be approximated by the equation Speed = gT/2π, where T is the wave period and g is the acceleration due to gravity (9.8 meters per second squared). Shallow water waves are those moving in water less than one-twentieth the depth of their wavelength. Waves approaching shallow water at a shoreline are in this category. In these waves, the orbits of water particles are flat ellipses rather than circles. Shallow water wave movements can be felt at the bottom, and their interaction with the bottom affects both wave and sea floor. Shallow water waves include both seismic sea waves (tsunamis) generated by earthquakes at sea, and tide waves generated by the attraction of the Moon and the Sun on the ocean. Both of these wave types have such long wavelengths that average ocean depths are easily less than one-twentieth that value. The speed of shallow water waves decreases as the water depth decreases; it is equal to 3.1 times the square root of depth. Transitional waves have wave lengths between 2 and 20 times the water depth; their speed is controlled in part by water depth and in part by wave period. As waves approach landmasses, the wave base begins to contact the sea floor and the wave's profile begins to change. This friction slows the circular orbital motion of the wave's base, but the top continues at its original speed. In effect, the wave begins leaning forward on its approach to shore. When the wave's steepness ratio reaches 1:7, the wave's structure collapses on top of itself, forming a breaker. A spilling breaker is the classic rolling wave coming up a gradually sloping sandy beach. The long incline drains the energy of the wave over a large area. The classic curl of a breaking wave is associated worldwide with surfing. As a wave approaches shore, friction slows the bottom of the wave while allowing the top to continue moving, which causes the top to lean forward in this manner. than the slowing wave base, and the water outruns itself with nothing beneath for support. Along oceanfronts with steep inclines or cliffs, a wave's energy is expelled in a very short distance, often with great force. These surging breakers develop and break right at the shoreline, proving dangerous and sometimes fatal to unsuspecting beachgoers. The tremendous energy dissipated at the ocean-level interface results in enormous erosion and deposition. Seldom do wave fronts approach the shore parallel to the beach. Rather, their direction of approach varies according to the prevailing winds and the contour of the oceanfront. As a wave approaches a straight shoreline at an angle, one part of the wave base may begin to feel the bottom first and begins to slow before the rest of the wave. This causes the wave crest to bend towards the shore, termed refraction, allowing waves to break more closely parallel to the beachfront than was their original direction. Along irregular shorelines, waves also refract, but tend to converge on headlands, causing erosion of sediments; they disperse in bays, causing deposition. As waves contact the oceanfront, not all their energy is expelled. The wave will tend to reflect back to sea at an angle equal to its approach. The reflected waves may form wave interference patterns with the original incoming wave fronts. Wave diffraction is the creation of a wave around an obstacle and depends on the interruption of the obstacle to provide a new point of departure for the wave. 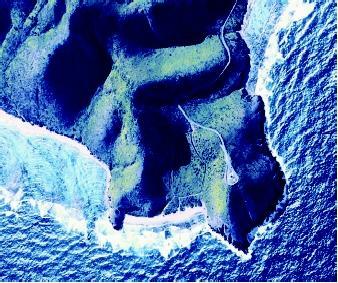 As waves approach a chain of islands, some of the approaching wave's energy is directed through the spaces between the islands. These spaces serve as a starting point for new waves that spread across the ocean surface beyond the island chain. Waves refract (bend) as they approach shallow water. Waves also can diffract (bend) around an obstacle, or reflect (bounce back) when encountering a vertical barrier. Wave refraction patterns are visible in the shallow water to the left of this point, which is Point Udall in St. Croix, U.S. Virgin Islands. Most waves are formed by wind, usually by storm systems. Unlike storm systems that are observed over land, ocean storm systems can be quite large, some exceeding 805 kilometers (500 miles) in diameter. These systems break up as they approach land, but over the ocean there is little to affect them. The wind transfers its energy to the water through wave-building directly under the storm system in an area of mixed wave types simply termed "sea." Factors that affect the amount of energy transferred to the waves depend on wind speed, the duration of time the wind blows in one direction, and the "fetch," the distance over which the wind blows in one direction. Sea-wave heights determine the amount of energy transferred. Normal sea-wave heights average less than 2 meters (6.6 feet) but have been observed reaching 10 meters (33 feet.) Once the wave steepness reaches the critical 1:7 ratio of wave height to wavelength, the wave breaks and openocean breakers are formed, termed whitecaps. At a given wind speed, there is a maximum wind duration and fetch which allow the waves to be fully developed. This "fully developed sea" is in equilibrium and is defined as the maximum size to which waves can grow under given conditions of wind speed, duration, and fetch. At this point, the waves of a fully developed sea will gain as much energy from the wind as they lose to gravity as breaking whitecaps. Evidence of wave action is seen in these giant sandwaves as viewed from a helicopter during a Lidar survey off Florida's coast. Lidar is an acronym for light detection and ranging. winds decrease near the margins of the storm system. The waves soon begin to outpace the wind speeds; waves with the longest wave lengths travel fastest; these large waves traveling away from a storm are called swell. Swell waves are long-crested, uniformly symmetrical waves that have traveled outside the area of their origin. Swell waves expel little energy and travel vast areas of the ocean, fanning out from approaching storm systems. Wave dispersion begins to take effect and the swell waves becomes grouped by their wavelength. Waves with longer wavelengths travel faster and soon outrun the slower waves with shorter wavelengths. The long-wavelength waves do not have steep wave heights but move out of the generating area first, with wave groups of progressively shorter wavelengths following. This procession is termed a "swell wave train" and can travel long distances, breaking on distant shores. As storm systems approach shore from far at sea, swell will begin to break, forming long, low rolling surf. Medium size swell follows with taller, curling breakers. As the storm system nears shore, the swell comes in high and fast with plunging breakers and crashing surf. As swell wave trains fan out across the Earth's oceans, waves from different storm systems will eventually meet and collide, causing interference and interesting wave behavior. When swell wave trains collide they can produce several types of interference. Destructive interference occurs when the wave crest of one swell combines with the wave trough of another. The energy from these swells cancels each other out and the surface becomes calmer. 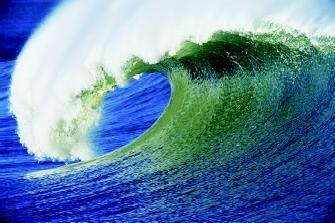 Commonly, however, swell wave trains combine in mixed interference, producing unpredictable and complex wave patterns and heights. This type of interference may produce rogue waves, extremely large unpredictable waves that can be very dangerous to ships. On rare occurrences in the open ocean, an unusually large wave may develop. These rogue waves are massive, single waves that can reach extreme heights of 15 to 30 meters (50 to 100 feet) or more. It is believed that one cause for rogue waves is overlap of multiple waves that produce an extremely large wave; they tend to occur most frequently downwind of islands and shoals. If storm winds push waves against a strong ocean current, rogue waves can develop. In the Agulhas Current off the southeastern coast of Africa, Antarctic storms push waves northeast into the oncoming current. Rogue waves have destroyed many ships in this region, capsizing them, smashing bow or stern, or lifting them amidships to snap the keel. Internal waves are disturbances that occur at the boundary between two water masses of different density. The wave heights can be quite large, sometimes exceeding 100 meters (330 feet) and may be formed by tidal movement, turbidity currents, wind stress, or passing ships. The surface expression of the waves is minimal, but if the crests approach the surface they affect the reflection of light from the water. 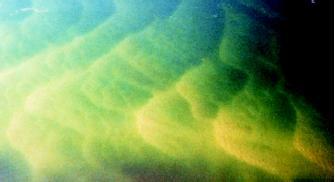 Excellent photographs of internal waves have been taken from the space shuttle. As internal waves approach a landmass, they build up and expend their energy as turbulent currents. Kelvin waves in the western Pacific Ocean are internal waves that form near Indonesia and travel east toward the Americas whenever the west-to-east trade winds diminish. A typical Kelvin wave is 10 centimeters high, hundreds of kilometers wide, and a few degrees warmer than surrounding waters. Scientists pay careful attention to these Kelvin waves because they may be precursors of the next El Niño. Seismic waves are formed when a severe shock such as an earthquake affects the ocean. The largest seismic sea wake known from geologic history is the one created by the impact of the K-T meteor 65 million years ago. The 10-mile-wide asteroid hit Earth at 72,000 kilometers (45,000 miles) per hour and created a wave estimated to be 914 meters (3,000 feet) high that traveled throughout Earth's oceans. Seismic waves are also referred to as tsunamis, their Japanese name. Sometimes they are incorrectly called tidal waves; they are not associated with the tides. Tsunamis typically have wave lengths of 200km, which makes them shallow water waves even in the ocean. They travel extremely fast in open water, 700 km/h (435 m/h). These waves have insignificant wave heights at sea, but in shallow coastal waters they can exceed 30m (100 ft). They may travel thousands of kilometers across the ocean nearly unnoticed until they reach land. Earthquakes in the Aleutian Trench regularly send large seismic waves across the Pacific Ocean, affecting Hawaii and the coastlines of the North Pacific Ocean. The seiche phenomenon relates to the rocking of water in a confined space at a resonant frequency. When disturbed, water in a pan, bathtub, lake, harbor, or ocean basin will slosh back and forth at a particular resonant frequency. The frequency will alter with changes in the amount of water and the size and shape of the confined space. This is one type of standing wave rather than a moving progressive wave. Seiche wave periods can last for a few minutes to more than a day and have extremely long wavelengths. Even so, damage from seiche waves is rare because wave height in the open ocean generally is only a few inches. Large waves generated by hurricanes and other natural events can wreak havoc along the coast and cause flooding far from shore. Despite the sometimes spectacular damage caused along the coast, inland flooding causes approximately half of the hurricane-related deaths in the United States. 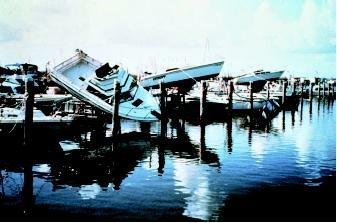 These boats in a marina were tossed about by Hurricane Andrew in 1992, whose storm surge inundated areas from the northwestern Bahamas, through the southern Florida peninsula, up to the coast of Louisiana. Another phenomenon, storm surge, is associated with weather and is very dangerous. The air pressure over a section of the ocean affects the sea level. Sea level under a strong high-pressure system is pushed downward to a level several centimeters below normal sea level. Conversely, under an area of extreme low pressure, such as a hurricane or tropical storm, a mound of water develops and is pushed along by the storm front. As the storm system approaches land, the mound of seawater becomes a mass of wind-driven, elevated water, usually associated with large storm waves. Storm surges are most dangerous when they coincide with high tides. They are responsible for the majority of flooding and destruction associated with hurricanes. Ninety percent of people killed by hurricanes are killed by storm surge. Severe hurricanes can produce storm surge to 12 meters (40 feet) in height. SEE ALSO Beaches ; Coastal Ocean ; Energy from the Ocean ; Marginal Seas ; Tsunamis ; Tides . Thurman, Harold V., and Alan P. Trujillo. Essentials of Oceanography. Englewood Cliffs, N.J.: Prentice Hall, 1999. NOAA Wavewatch. National Oceanic and Atmospheric Administration. <http://polar.wwb.noaa.gov/waves> . The excitement of flying down the face of a monster wave lures more than 2 million surfers to American beaches annually. As swell approaches the beach and the breaker begins to form, wavelength decreases and wave height grows. The surfer must paddle the board with energy to match the speed of the oncoming wave. If timing is right, the surfer can get on the board just as the curl of the plunging breaker begins to form. When swell comes onshore at an angle, a long curling breaker can form that rolls down the length of the beach. Surfers praise these breakers. A skilled surfer can catch an extended ride inside the curl. I found this article very helpful and it had the facts explained well. This article was very useful. Could you please state when it was written so that I can use it as a reference for my dissertation.